Despite the bustle that inevitably accompanies the holidays, this is my favorite season of the year. Our home gets all sorts of warm and cozy all season long, thanks to festive holiday touches and glowing twinkle lights sprinkled throughout! 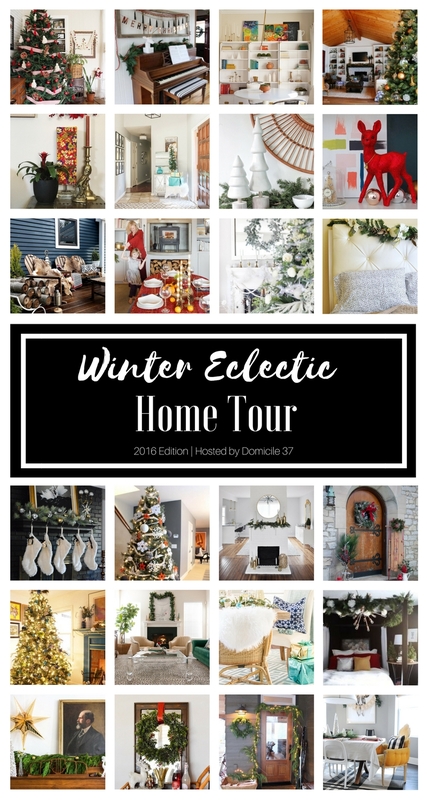 Come on in and take a peek into our "warm and cozy" holiday home, which I am sharing as part of a winter blogger home tour hosted by the super talented Jess of Domicile 37! 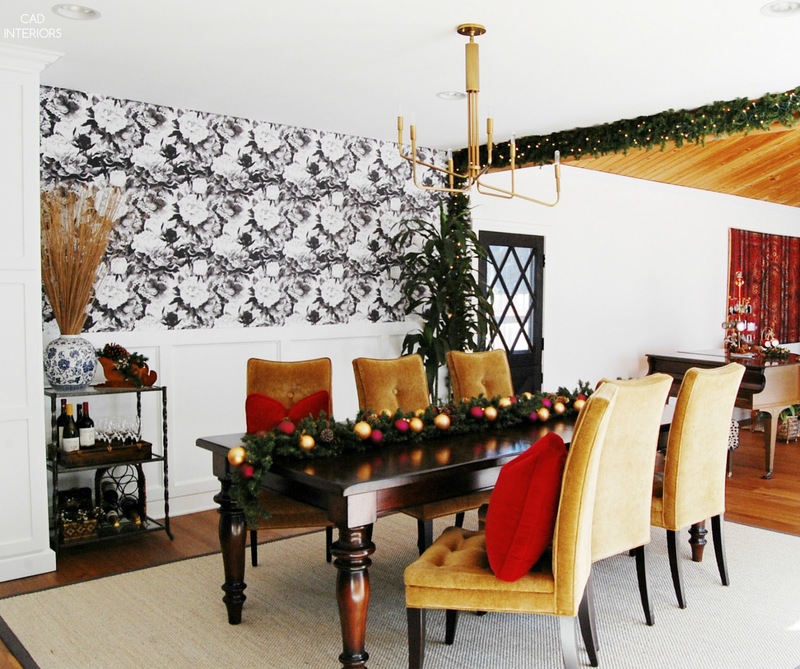 All week long, a group of eclectic design bloggers will be sharing a tour of their homes decked for the holidays! Warmest welcome to those of you who are making your way over from the witty and talented Sharon of Sharon Joyce Interiors. 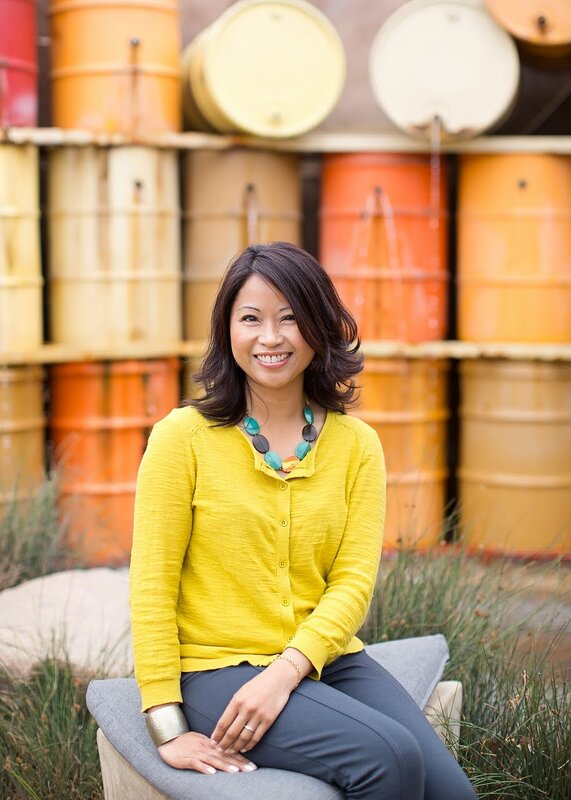 For those of you who are new here, I'm Carol, a design blogger with an affinity for modern, eclectic, and collected interior style. Our real-life budget has made our 1955 fixer upper home renovation a 3-1/2 year process thus far! 😄 I share our renovation stories here on the blog, along with affordable design tips and stylish inspiration. Our family room went through a complete renovation two years ago, which you can read about here. 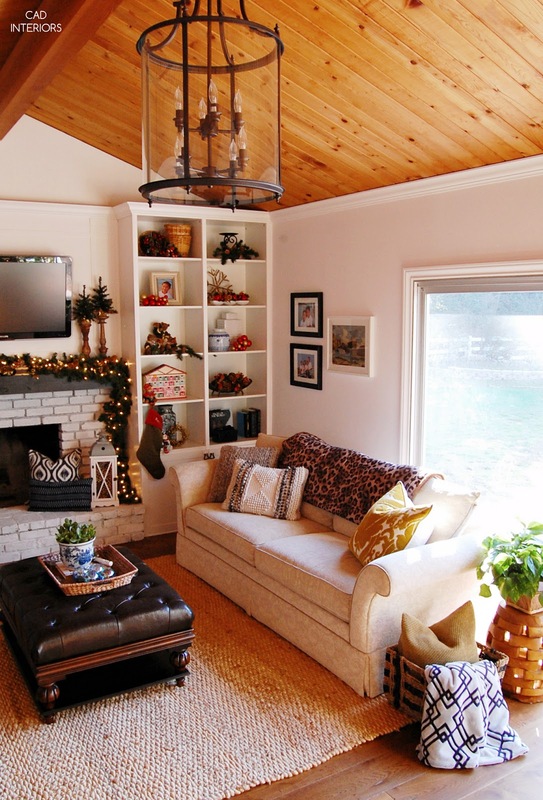 Lots of cozy snuggling and lounging happens in this room! Every Christmas, the only thing we buy is a fresh tree. All the decor is from my holiday stash that I've collected in years past. The California drought really affected the fresh tree supply this year, so it was very slim pickings for a lush, tall noble fir tree that didn't have brownish branches! This smaller noble fir does the job, and it fills our home with that fresh pine aroma! I kept the tree decor simple with mostly gold/brass, silver, and glass ornaments, after going a more traditional color route last year. Onto the adjacent dining room, which we spruced up during the Spring 2016 One Room Challenge! 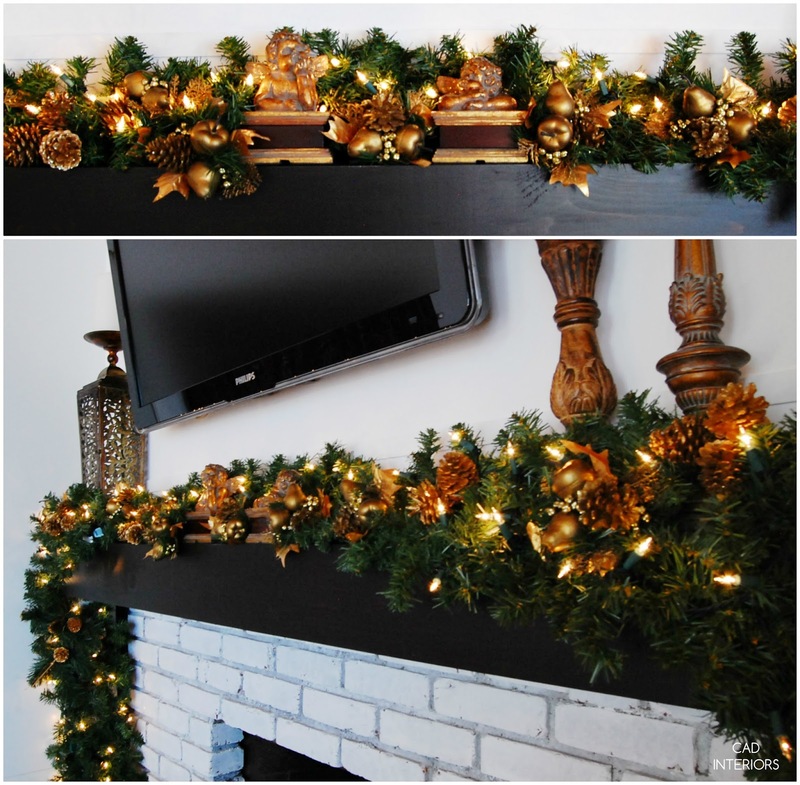 Right now, my favorite part of the room is the garland that's strung on the beam! The room takes on a warm glow at night that is just so inviting. love your home, carol! the dining room looks amazing as always, but i really fell in love with the living room this time! that ceiling is awesome! 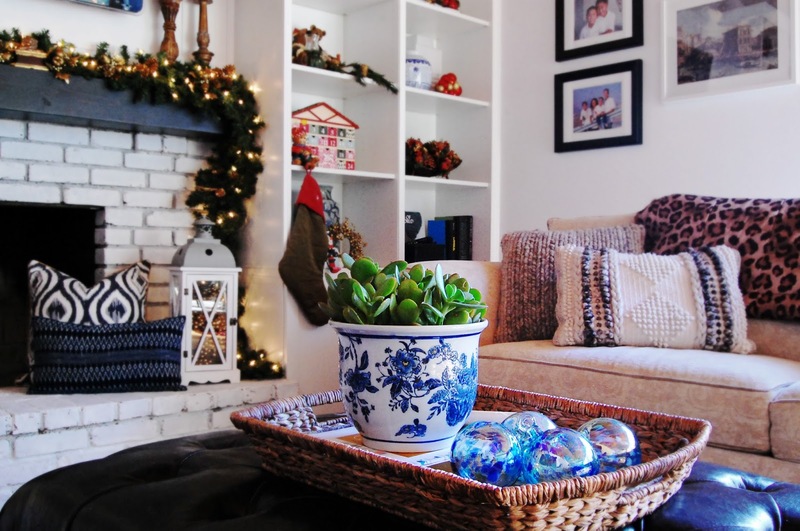 i love how you framed the spaces with garland! Thanks so much, Cassie! The wood beamed ceiling is one of my favorite original features of this house. Happy holidays to you and your family! I absolutely love your home!!!!!!!! I cannot say it enough. Every time I see your space, there is something always added on to my list of why I like your home. 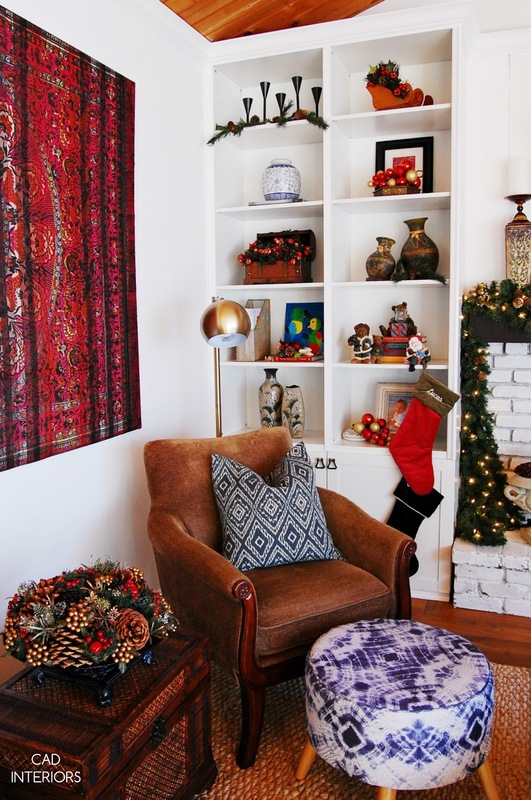 That rug you have hung on your wall is genius and I love the traditional Christmas decor. Absolutely Perfect! Your home is absolutely stunning! 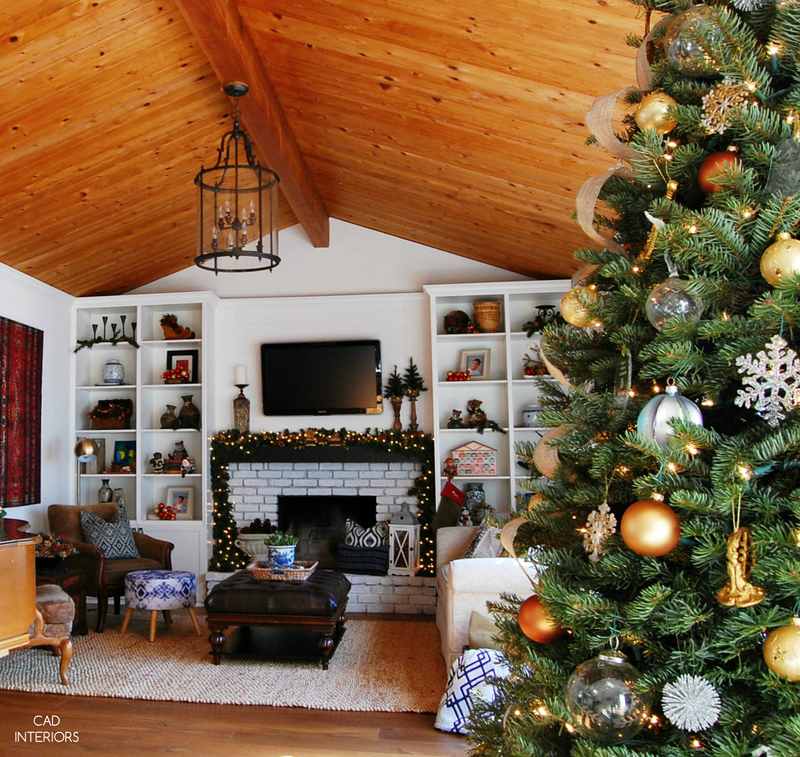 The warm wood ceiling is perfect with Christmas decor and I LOVE the garland on the beam in the doorway! Gorgeous! It's gorgeous Carol! So warm. Love it. Those ceilings in your great room just take my breath away! For being a big room you've made it feel so cozy. Hi, Carol! It was so nice seeing your lovely home decorated for Christmas. I love the voice ornaments--what a wonderful idea! 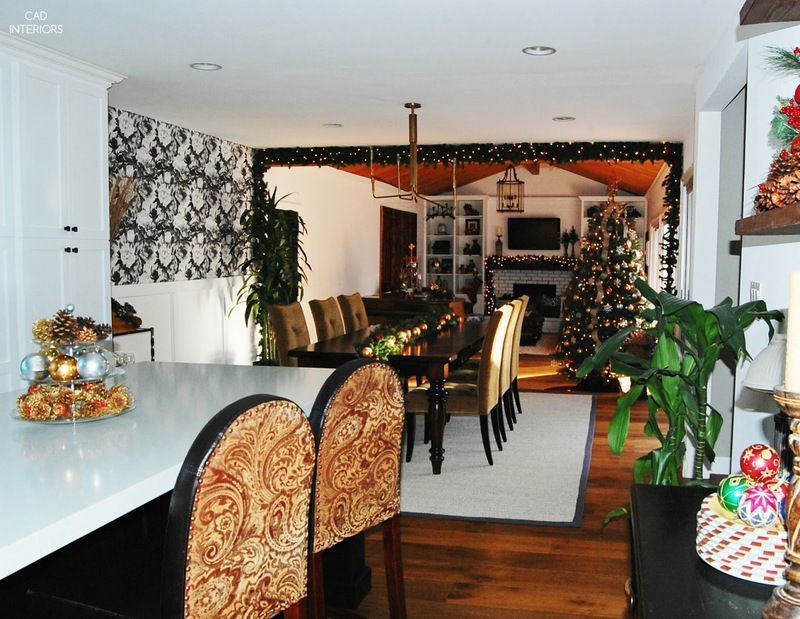 The garland between the dining and living room is beautiful. Wishing you and yours a very Merry Christmas! Thanks Sharon! I keep those voice ornaments out year round now. Hearing their baby voices helps diffuse situations when my boys are testing my patience. :) Wishing you and your family a blessed Christmas! So many beautiful garlands! this is gorgeous!!! Thank you so much, Mila! I appreciate the kind words. Happy holidays! Your home is so warm and inviting! I love those pictures of the entire space. Stunning!! Thank you, Kathy! You're so sweet. Our home has been a work-in-progress for years now, and it's nice to have this space "done" so we can enjoy it. Wishing you and yours a happy holiday season! Carol, it's all so gorgeous! You know how much I adore your dining room and that chandelier!!!! Stunning! Aww, thanks Carli! Our dining room isn't a huge space, so it was fun to make a statement in there. Looking forward to your home tour later this week. :) Happy holidays! 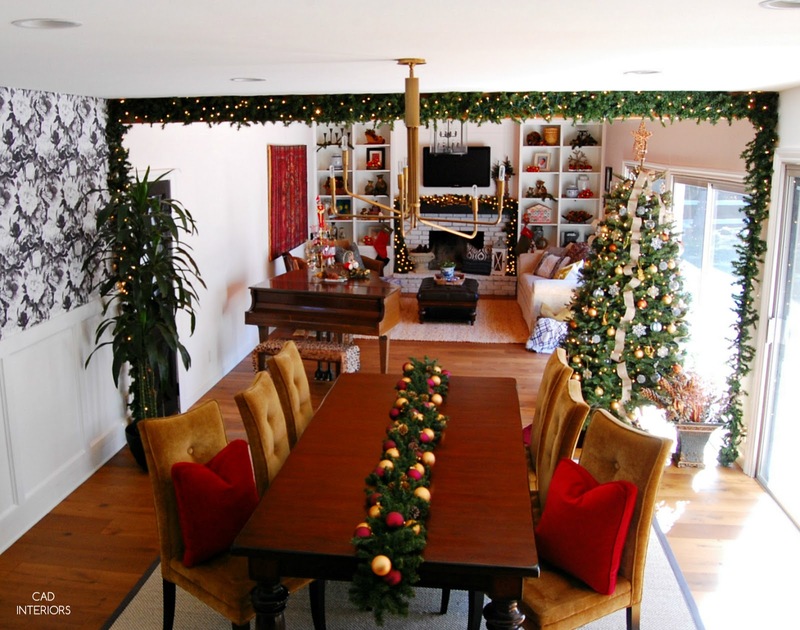 That vaulted ceiling is such a beautiful backdrop for the tree, and I love the dinning room with the pop of red. Merry Christmas! Thank you, Maggie! Wishing you and your family a Merry Christmas! Carol this is gorgeous!!! I love the garland around the door frame for sure! 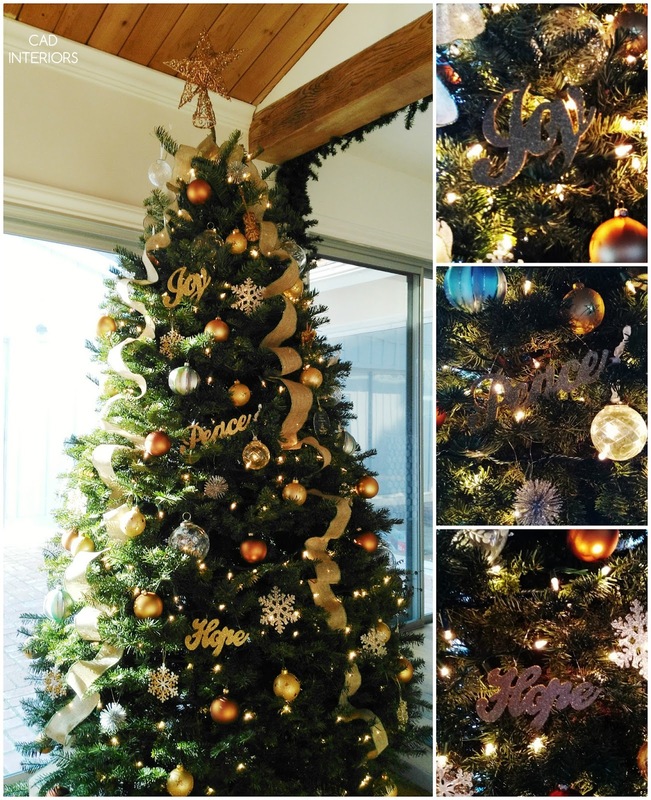 The tree is beautiful and all your festive styling is spot on! Thanks Stephanie! The beam is one of my favorite spots to add garland because I love having the twinkle lights frame the two spaces! Hope you are enjoying the holiday season with your family! Aw... 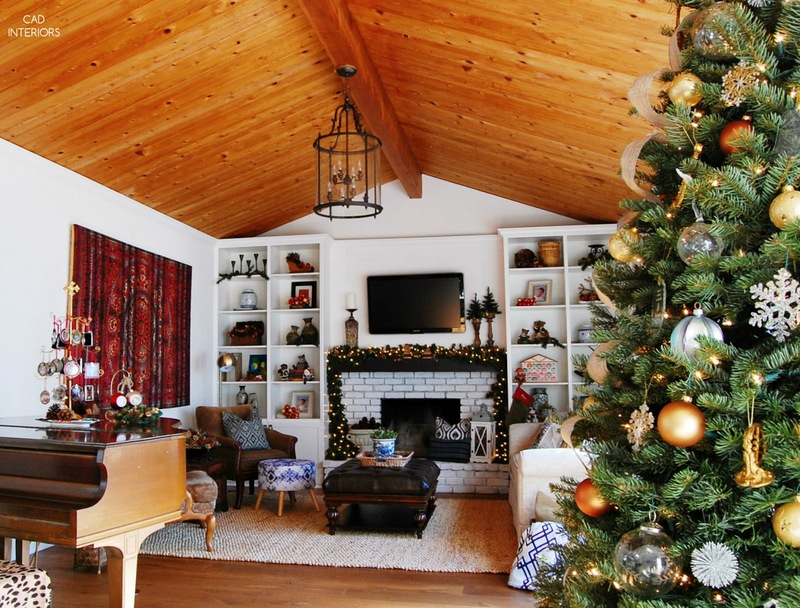 It looks so festive and cozy! I love your house, too! The dining room light, chairs and wallpaper are gorgeous. I love how you decked out the table, too. And, the living room shelves are so pretty! Love your decor! You're so sweet, Karrie! Thank you. :) So glad to "meet you" on this tour. Wishing you and yours a happy holiday season! Carol, your home is just stunning! Love how eclectic and polished it feels. 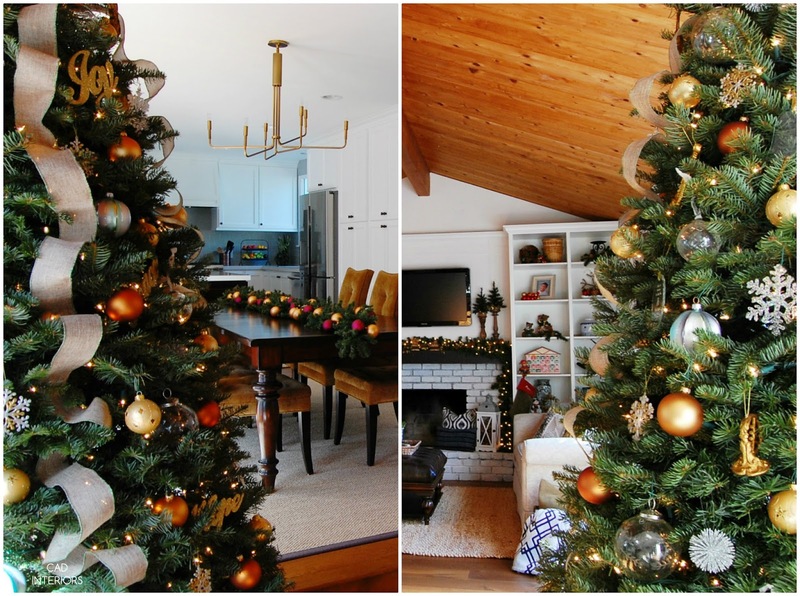 Your gilded tree is so incredibly beautiful...as is the vaulted ceiling in your living room! Happy Holidays! Aww, thank you Astrid! That means a lot coming from you... I love your style and home! Can't wait to see your home tour. Happy holidays to you and yours! Your home is so beautiful! 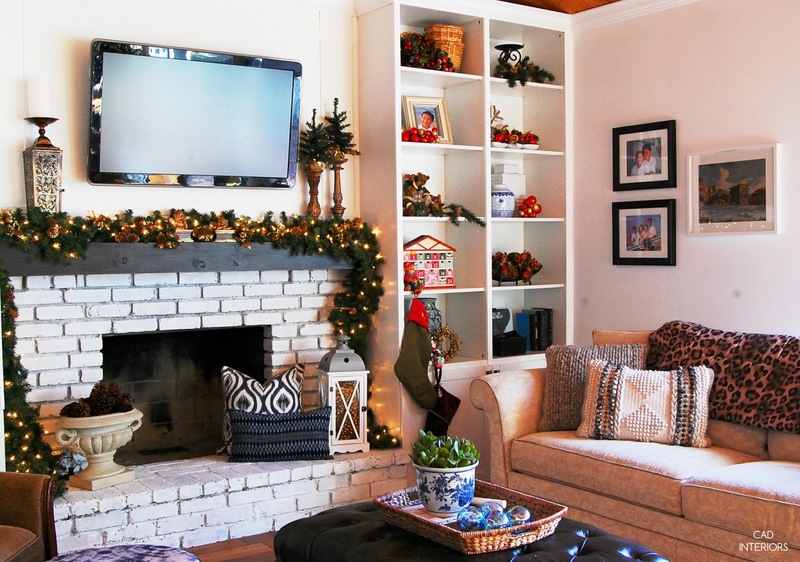 That garland and tree are perfect for your home. And that wallpaper in your dining room is incredible! Happy Holidays! Your home is just gorgeous! I remember you dining room from the ORC right?! Love too the ornaments on top of your piano, I have something similar in my duaghters bedroom! 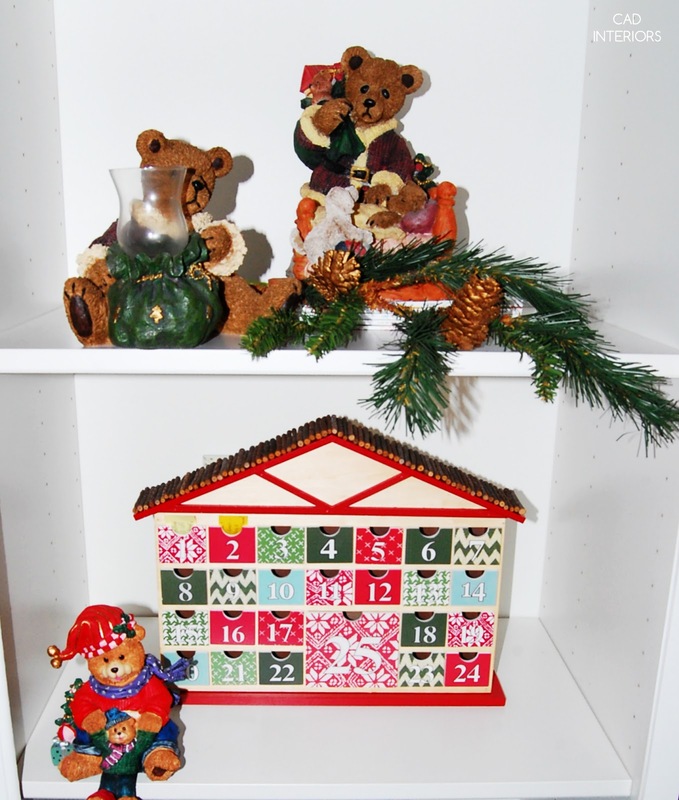 Thank you for joining the 12 days of Holiday Homes tour! 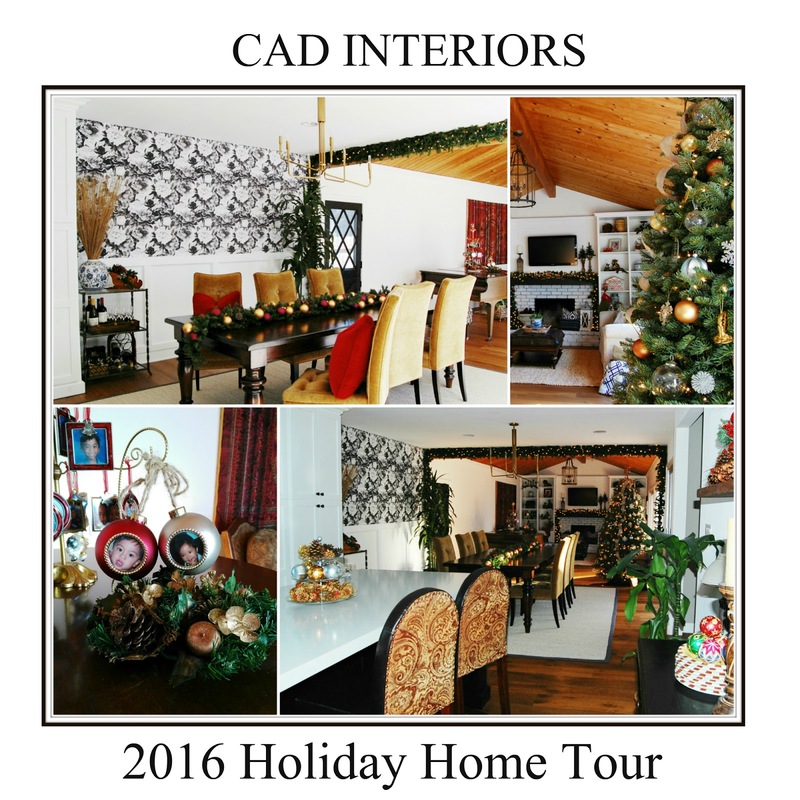 Hope you have time to visit my home tour too! Have a very Merry Christmas! Thank you, Vel! 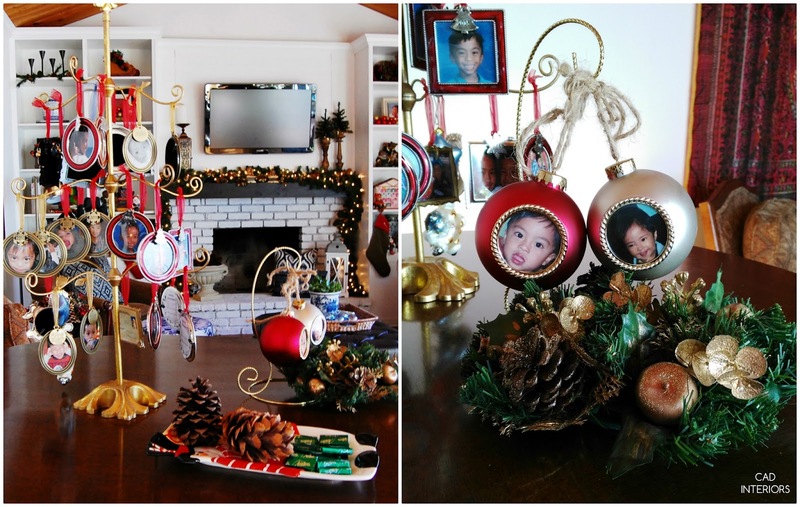 Those photo ornaments are a treasured collection that will keep on growing! Yes, our dining room makeover was part of the Spring 2016 ORC. The adjacent family room was also my first ORC in the Fall 2015. 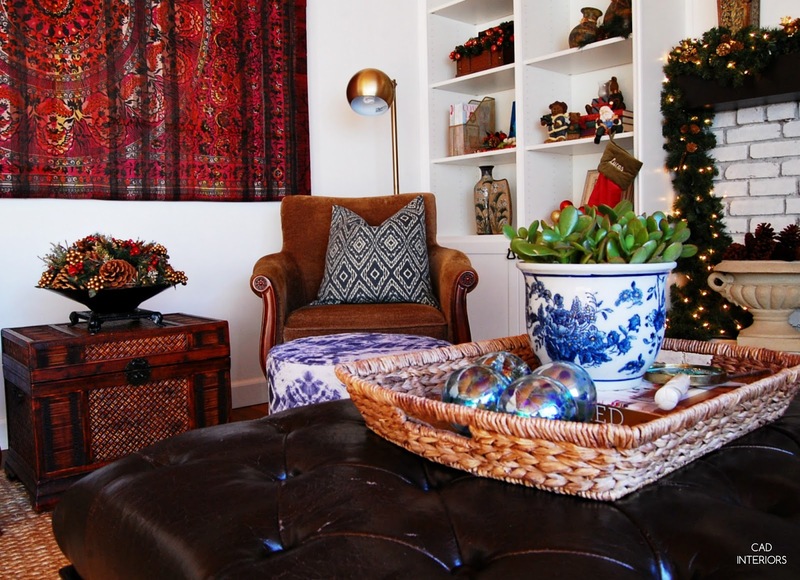 I will definitely check out your home tour, as well as all of the participants' on the 12 days of holiday homes. Merry Christmas to you and your family! I couldn't agree more....the garland on your beam is BEAUTIFUL! I'm also crushing hard on your wallpaper and those fab pillows. What a beautiful Christmas home! Happy Holidays!! Aww, thank you Rachael! I love that wallpaper too. It was worth the wonky wall challenges we put up with when we installed it! Happy holidays to you and yours!